This individual Report Closed Prepaid Market Performance: Spend, Growth & Opportunity is available for purchase. This Report is available to members of Mercator Advisory Group’s Prepaid Advisory Service. Please be advised that this Report is normally part of a research and advisory service that provides ongoing support throughout the year. As such, this Report contains significant depth of content that is selected for its strategic importance to our members. (For a description of these services, see our Advisory Services section). The report "Closed Prepaid Market Performance: Spend, Growth and Opportunity" documents the current state of the Closed prepaid market which grew from $105.98 billion in 2003 to $124.88 billion 2004, an increase of 17.8 percent. This means that in 2004 Closed prepaid segments were responsible for more than 93% of all prepaid spending. This report identifies spending for 24 Closed market segments, including four Telecom segments, Petroleum, Gift Cards and Prepaid Malls, Government, Digital Content, and Campus. This report also provides an estimate of the number of cards issued for the 19 Closed prepaid market segments that issue cards. Many of these market segments are not card-based, including toll systems that utilize car transponders and utilities that use electric or gas meters. Of course, the Digital Content market is rapidly adopting prepaid solutions and has grown with Games & Ring tones accounting for $2.6 billion in spending alone. The diversity of Closed prepaid market is remarkable and is also a significant contributor to the market success. The fastest growing segment in this report, discussed in great detail, is Distributed Gift Cards which includes Prepaid Malls. "The Distributed Gift Card business is growing at 160% and could grow significantly faster if it finds multiple categories that sell as well as Long Distance Cards and Mobile Minute", noted Tim Sloane, Director of Mercator Advisory Group's Debit Advisory Practice. 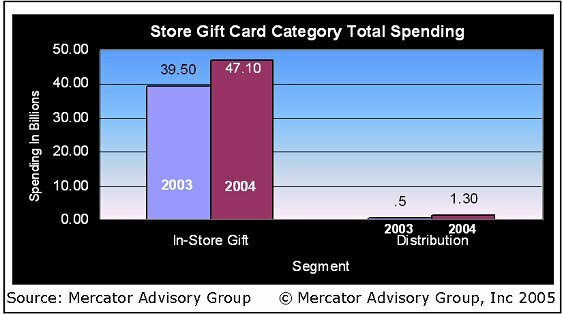 The use of Gift Cards to assist broad based consumer acquisition efforts is also growing rapidly. Consumers find plastic far more compelling than coupons, and marketers are rapidly discovering this fact. When businesses discover that these cards can also be used to more easily convert new customers to in store loyalty cards, the market will grow even faster. The report contains 36 pages and 29 Exhibits.